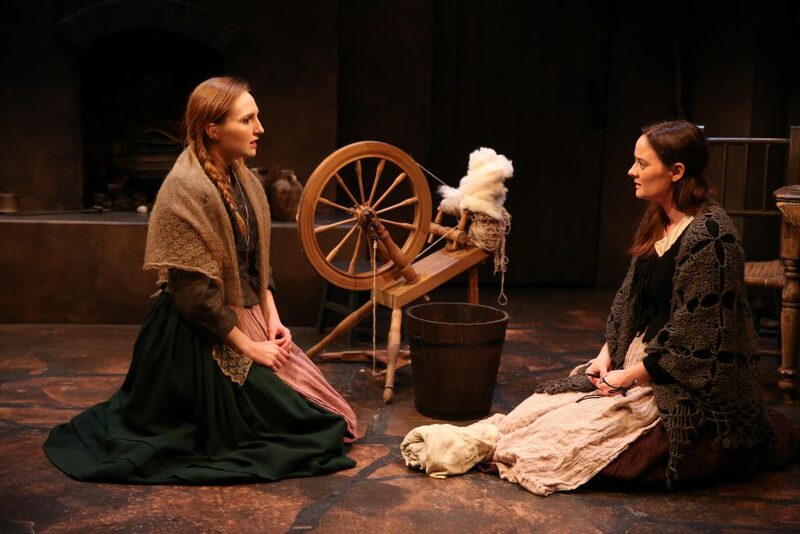 Clare O’Malley and Jennifer McVey in “Riders to the Sea,” one of the plays in “Three Small Irish Masterpieces” at Irish Repertory Theatre. The show now playing at the Irish Rep needs no recommendation; it has been mostly sold out for weeks and extended through April 22. This reviewer snagged the sole cancellation seat in the house for last Sunday’s matinee. Maybe part of the curiosity is that “Three Small Irish Masterpieces” includes a joint work by poet William Butler Yeats and Lady Gregory, best known perhaps as his patron and co-founder, with others, of Ireland’s national theatre, the Abbey, which first opened its doors in 1904. 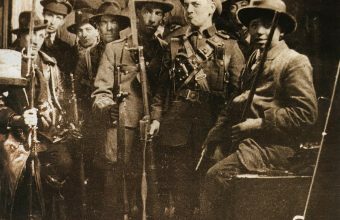 It was a time when Irish people’s struggle for independence was expressed through the Home Rule political movement. Though part of the Anglo-Irish landowning class, Gregory and Yeats were political and cultural nationalists in their way, believing Ireland should also have homegrown theatre, with Irish plays performed by local actors rather than imported English dramas. John Millington Synge was of the same mind. Another Abbey co-founder, he was active in what became known as the Celtic Revival—a movement that emphasized the Irish language, Irish arts and folklore. Lady Gregory, who wrote or translated nearly 40 plays, is represented on the Rep’s notably nice program in the center of three (tri-color) columns. She separates the male playwrights—perhaps reflecting her role of reportedly smoothing differences between the egotistic founders of the Abbey. Songs that precede and link the plays form a thread. They also provide a rare chance for New Yorkers to hear Irish (or Gaelic) on stage. And, they mark a shift in tone from playful to ominous, as the first gives way to one of several freedom songs, this one telling rebels where to meet under darkness. That’s the core of the second play, where an Irish native working for the Crown is on the lookout by moonlight for an Irish rebel with a £100 bounty on his head. It was a bit distracting that the Irish rebel (Adam Petherbridge) had an English accent. Otherwise, there was great tension in the patriotic play—not quite with a twist, more so one in which the audience’s growing premonition is proven right. Charlotte Moore, the Rep’s artistic director, directs the scene with two, jumpy strangers back-to-back on watch so well that this reviewer dropped her notebook, by jumping along with them. Colin Lane, as the sergeant in this play and the dominated husband in the first play, is always a pleasure to watch. Fittingly, Donnelly is a member of the Abbey—as well as Irish Rep and the British National Theatre. The dreadfully fatalistic note on which the play ends, emphasized by keening that takes the form of a chakra-stirring chant, is a blow. Such a blow that I crawled to the nearest café for the proverbial cup of ambition to get me home. “Three Small Irish Masterpieces,” directed by Charlotte Moore, runs through April 22 at the Irish Repertory Theatre, on West 22nd St. Tickets are on sale via Irish Rep’s box office, 212-727-2737, or online at www.irishrep.org. 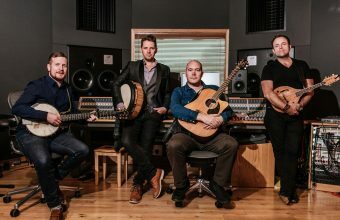 High Kings: Irish folk band of 21st c.